How Search Window works and tips to set it in BSC for cdma, sector is assigned pn offset , search window, reference pilot, propagation delay, pilot signal. Search Window in cdma is essential parameter to work cdma technology because based on search window as defined in system mobile needs to take important decision for available bts. Search window play main role in mobile switch on, handoff, access etc. let’s check in detail. A CDMA system employs the synchronized detection technique on the forward link. In order to successfully demodulate the intended signal, a MS must be able to estimate the system time with precision. The MS is receiving a pilot signal and will get the estimation from this reference pilot channel. Using this reference pilot as the reference signal, the MS can send and receive signals with any PN code by modulating and demodulating the carrier wave. Search Window will help to Search Pilot How? The pilot intended for a MS may not arrive precisely at the anticipated time because the system time estimated by the MS also includes the propagation delay of the reference pilot, and besides, the time shifts of other pilots arriving at it are also based on their propagation delays. The MS cannot tell the propagation delay of a random given pilot, and therefore it must search the pilot within an appropriate delay window till it detects the actual time shift of the reference pilot, and this window is referred to as the search window. A MS would search the pilot using the following 3 different types of search windows. SRCH_WIN_A (Search window Active): used to search the activated and candidate pilot set. SRCH_WIN_N (Search window Neighbor): used to search the adjacent pilot set. SRCH_WIN_R (Search window remaining): used to search the remaining pilot set. 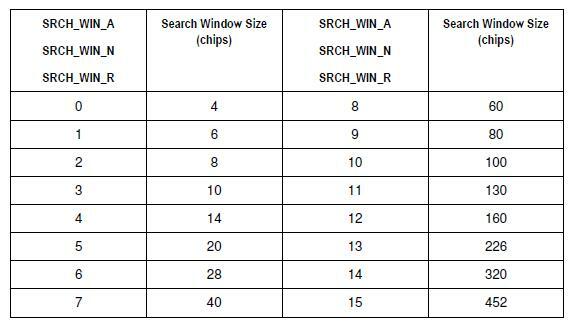 The measurement unit for each window is “chip”. As illustrated in the figure below, the center of a SRCH_WIN_A window is located near the peak of the first arrived multipath component. With the SRCH_WIN_A as the reference, the center of a SRCH_WIN_N or SRCH_WIN_R is located about at the PN offset from the moment when the intended pilot arrives. As illustrated in the figure below, suppose a sector is assigned PN offset 4, and an adjacent sector is assigned PN offset 20. With a search window, a MS can detect multipath components either before or after the arrival of the intended pilot, and therefore, it can maintain a coherent detection regardless of the propagation delay. The size of a search window must be set to the effect that the best quality pilot signal should fall into it. What is search window value define wrong ? If a search window is too small, the important pilot signal will be lost, thus resulting in interference. if it is too large, the search efficiency will decrease, and the conversation quality will be compromised. Tips : So what to set in rural area 60, 80,100 chips and in urban 40, 60, 80 active search window, neighbor search window and remaining search window respectively. Try this Optimization: I set 20, 20, 40 in my city site which having high utilization its reduce it by 8-10% check it yourself it useful to reduce blocking if your traffic is nearby city. 26 queries in 0.350 seconds.